Few people pull off plaid like Adam Scott, who plays lovable nerd Ben Wyatt on NBC’s Parks and Recreation and now stars as an adult child of divorce in the quirky comedy A.C.O.D., in theaters October 11. The 40-year-old actor may be tight with Jon Hamm, but he prefers to take style tips from Tootsie. Essential Homme: At what point in your life did you begin finding your style and investing in your wardrobe? 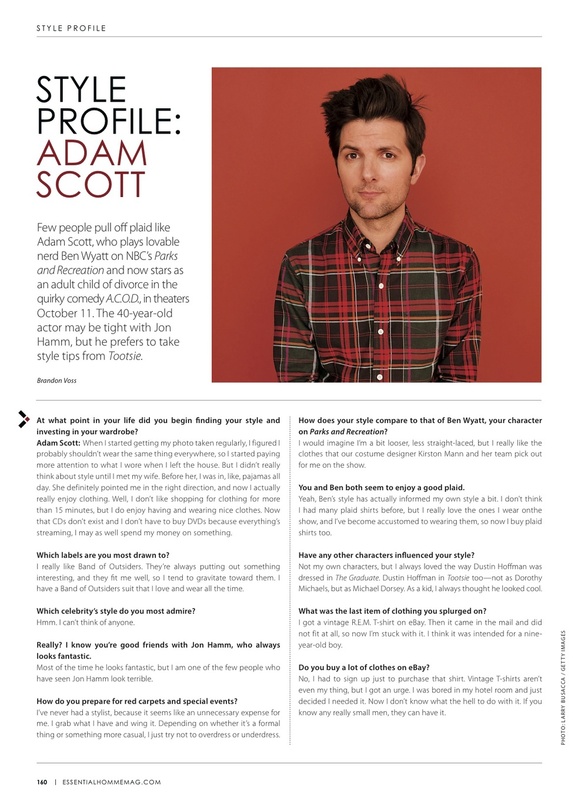 Adam Scott: When I started getting my photo taken regularly, I figured I probably shouldn’t wear the same thing everywhere, so I started paying more attention to what I wore when I left the house. But I didn’t really think about style until I met my wife. Before her, I was in, like, pajamas all day. She definitely pointed me in the right direction, and now I actually really enjoy clothing. Well, I don’t like shopping for clothing for more than 15 minutes, but I do enjoy having and wearing nice clothes. Now that CDs don’t exist and I don’t have to buy DVDs because everything’s streaming, I may as well spend my money on something. Which labels are you most drawn to? I really like Band of Outsiders. They’re always putting out something interesting, and they fit me well, so I tend to gravitate toward them. I have a Band of Outsiders suit that I love and wear all the time. Hmm. I can’t think of anyone. Really? I know you’re good friends with Jon Hamm, who always looks fantastic. Most of the time he looks fantastic, but I am one of the few people who have seen Jon Hamm look terrible. How do you prepare for red carpets and special events? I’ve never had a stylist, because it seems like an unnecessary expense for me. I grab what I have and wing it. Depending on whether it’s a formal thing or something more casual, I just try not to overdress or underdress. How does your style compare to that of Ben Wyatt, your character on Parks and Recreation? I would imagine I’m a bit looser, less straight-laced, but I really like the clothes that our costume designer Kirston Mann and her team pick out for me on the show. You and Ben both seem to enjoy a good plaid. Yeah, Ben’s style has actually informed my own style a bit. I don’t think I had many plaid shirts before, but I really love the ones I wear on the show, and I’ve become accustomed to wearing them, so now I buy plaid shirts too. Have any other characters influenced your style? Not my own characters, but I always loved the way Dustin Hoffman was dressed in The Graduate. Dustin Hoffman in Tootsie too — not as Dorothy Michaels but as Michael Dorsey. As a kid, I always thought he looked cool. What was the last item of clothing you splurged on? I got a vintage R.E.M. T-shirt on eBay. Then it came in the mail and did not fit at all, so now I’m stuck with it. I think it was intended for a nine-year-old boy. Do you buy a lot of clothes on eBay? No, I had to sign up just to purchase that shirt. Vintage T-shirts aren’t even my thing, but I got an urge. I was bored in my hotel room and just decided I needed it. Now I don’t know what the hell to do with it. If you know any really small men, they can have it. 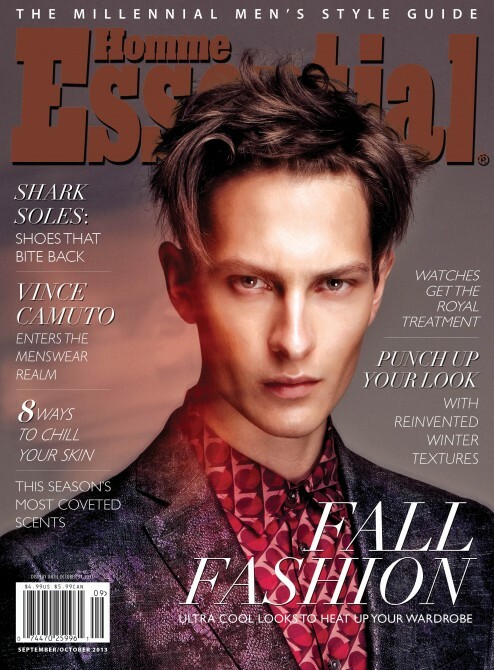 Essential Homme, September/October 2013 issue.